If you are thinking about getting married at All Saints, please contact the Vicar to discuss the matter. 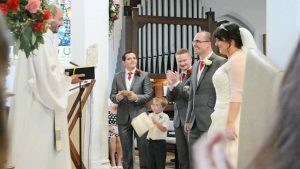 This link provides all sorts of information about weddings in the Church of England. To be married in the parish church you have to fulfil certain criteria and they can be found here. This church holds to the traditional teaching about marriage, so does not marry those who have previously been married (where a former partner is still alive). However, it is possible to have a Blessing of a Civil Marriage in the Church. Banns of Marriage need to be read in the parish where each of you lives as well as the church in which you are to be married (which may be somewhere else). If your marriage is taking place elsewhere and you need your Banns read here you can download and fill in a form. You will then need to fill in, print and sign the form, pay the fee and arrange for your identification to be checked (normally passport or driving licence). Please do this well in advance of your wedding. If you need to find out the Church of England Parish for a location enter your postcode after clicking this link.